A funny thing happened. At the end of October, I had a few clients reach out to me and say, "Hey Kurt, you should talk to this guy Reid who just gave an amazing presentation at eCommerceFuel Live about crowdfunding." Turns out they were talking about a client we'd worked with on crowdfunding campaign. Joining us today is Reid Covington, an energetic entrepreneur with a history of both realizing and accelerating growth for ecommerce businesses. By night, Reid is the founder of Chargemander.com where he successfully raised ~$200k on Kickstarting and another ~$200k on Shopify in their first 3 months in business. By day, Reid is the Director of eCommerce at FCTRY.com where he has helped to 10x their eCommerce channel from $300k/year to almost $3million/year over the last 12 months. 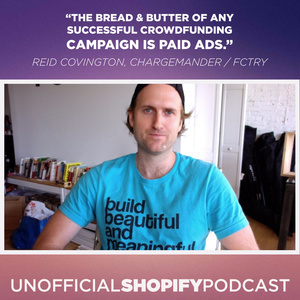 You'll find out exactly what Reid does to ensure their success on Kickstarter, and he even reveals his never-been-shared-publicly-before Kickstarter growth-hacking secrets. He even shares the real numbers behind their winning campaigns.